Now that we've arrived in the fall aka the Oscar bait time in the calendar of film studios as Hollywood execs begin scrambling to maximize audience interest or post festival buzz in their quest for gold, summer movie season seems like a blur. Yet earlier in the year and long before fanboys started lining up for J.J. Abrams' surprisingly brainy popcorn movie Star Trek, I was invited to take part in a MovieBlips survey of bloggers in sharing our thoughts, predictions, and take on the over-crowded slate of summer releases. As a female critic I was honored to be included yet it was a daunting task since box office guesses, predictions, and big budget Bay/Bruckheimer and testosterone fare generally aren't my cup of tea. Moreover, I could care less what a movie makes as opposed to the quality of a work itself. And while I took my best shot at questions involving box office successes etc., the question I found the most fun and challenging was regarding what I felt would be the sleeper hit of the summer or the movie I was most interested in seeing. While I think it's safe to say that (500) Days of Summer became the biggest sleeper hit, when asked about the movie I wanted to see the most, I hemmed and hawed until ultimately naming Away We Go. 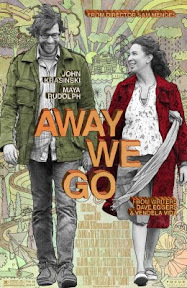 My reasoning was listed as follows: "I love the art house fare that falls below the radar so I’m really excited for Sam Mendes’ Away We Go which is a romantic themed comedy starring The Office’s John Krasinski and Kath and Kim scene stealer Maya Rudolph—co-written by Heartbreaking Work of Staggering Genius author Dave Eggers. The fact that Eggers is involved gives it immediate appeal—it’s like seeing the name Chabon or Hornby—not to mention, I’m not terribly sure what a Sam Mendes comedy would look like." Unfortunately, due to a scheduling conflict and the fact that it didn't last too long in my neck of the woods I never made it to the theatre so I was extremely eager to explore the film in high-definition Blu-ray form from Focus Features and Universal Studios Home Entertainment. And although I avoided reading too much about the movie from a critical standpoint so as not to spoil it, despite generally positive word-of-mouth and mostly enthusiastic reviews, I noticed that the charge being leveled at the film most often was that it was smug, elitist, hipster, superior, and misanthropic towards its audience and the supporting characters it presented onscreen. In arguably the most scathing indictment I found which was actually cited in the conclusion of Roger Ebert's glowing review, A.O. Scott of The New York Times charged that while audiences can "follow" [main characters] into the precious, hermetic paradise that awaits them," viewers should likewise realize "that you are not welcome" and "this movie does not like you." It's a troubling sentiment to be sure and one that I've definitely experienced in cinema over the years, most recently in the oeuvre of the nonetheless indisputably talented Coen Brothers as evidenced in another Focus Features release Burn After Reading which revealed that sadly misanthropy and disdain for the human race as idiots was once again their favored theme. 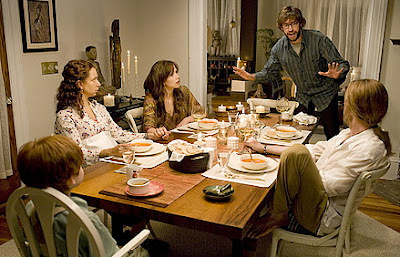 Yet while Burn had no heroic characters and the charge of superiority by myself and other critics in that particular case seemed leveled outside the movie towards the two Oscar winning filmmakers themselves, the peculiar thing about Away We Go was that two of its characters were being accused as superior elitists to everyone else on the planet. And while everyone is entitled to their opinion, it's a terribly surprising conclusion to witness as shortly into Sam Mendes' lively, lovely, literary yet lighter Away We Go, our two leads prove to be as clueless as the rest of us when we must move from one phase of life to the next. After a frank opening scene which finds Burt (Krasinski) and Verona (Rudolph) discovering that the two longtime lovers are going to become parents, they're unsure just what to do to ensure that their daughter will have a dream-like Huckleberry Finn childhood-- the kind that Verona had but doesn't often speak of as she's still devastated from the loss of her parents when she was in college. While Burt discusses his need to be a strong father who can protect and create by taking family self-defense courses and trying to figure out how to whittle wood, it isn't until they discover that Burt's parents are fulfilling their lifelong dream to move to Belgium for two years that they're truly faced with the terror that they're going to have to handle parenthood without a guidebook or support system. Realizing that their tiny home with a cardboard window is less than ideal and now that Burt's parents have flown the coop, they can leave the town they'd moved to simply to be close to them for any given location, Burt and Verona decide that-- unlike superior misanthropes-- they long to raise their daughter near family or friends. Thus to achieve this, away they go like modern day Huck Finns trying to find their own sense of freedom and belonging with stops that include relatives, colleagues and classmates in Phoenix, Tucson, Madison, Montreal, and Miami. 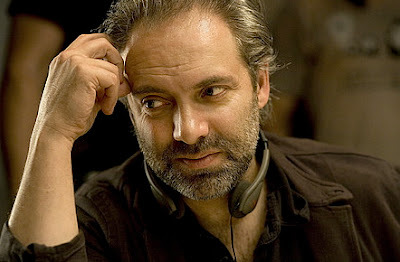 While basically everyone knows that the true journey in the film will be made in the hearts and minds of the characters themselves as home is a state of mind, director Sam Mendes assembles a dynamic cast including Allison Janney, Melanie Lynskey, Chris Messina, Paul Schneider, Maggie Gyllenhaal, Jim Gaffigan, Josh Hamilton, Catherine O'Hara, and Jeff Daniels to play eccentric individuals raising children who await the couple in every city. The two major comedic sequences occur in Phoenix and Madison respectively as we see parenting from the two extremes of inattentive to overly obsessive. The first stop reunites Mendes with his American Beauty actress Allison Janney as Verona's former boss in Phoenix. In this segment, Rudolph and Krasinski's subtle facial reactions are priceless as they try not to appear overly shocked by the crass, irresponsible and hard-drinking Janney and her gambling paranoid husband Gaffigan. On the other side of the spectrum, Burt's childhood friend Maggie Gyllenhaal (filling in for Toni Collette) makes you laugh until it hurts as a feminist, overbearing mother who preaches the importance of no separation, sugar, or strollers and believes in a family bed along with her husband (Josh Hamilton) who wishes he could give birth like a male seahorse. Understanding the importance of balancing out the comic and extreme with a look at how life works for relatively normal individuals who struggle ups and downs, the young couple is delighted to discover that their old college friends (Lynskey and Messina) seem to be on the surface the most contented individuals residing in Montreal with good jobs and their adopted brood of youngsters. Yet just when our leads realize that Montreal is the place for them, they're quick to recognize that things aren't so picture perfect and get a second reality check when a family emergency calls them to visit Burt's brother (Paul Schneider) in Miami who is struggling to raise his daughter alone. Similar to A Heartbreaking Work of Staggering Genius, the book that launched the film's co-screenwriter Dave Eggers (who penned this work with his author wife Vendela Vida), the movie meanders through laughter and tears sometimes simultaneously through its Huck Finn landscape of absurdity, beauty, freedom, optimism, harsh reality and love. Moreover, never once did I mistake Verona and Burt for superior beings as the two are flawed but kind individuals right from the start (hopefully like most of the viewers) who are just trying to navigate uncharted terrain the best they can while planning for the future and drawing from their past as Verona must eventually face her parental loss. Likewise the film reaffirms throughout that there's no one way to raise a child along with the important lesson of what a family actually means. And throughout, I kept marveling at the sheer joy infused in the work as the two characters openly share their fears and hopes for their unborn daughter in a way I've personally never seen onscreen as usually we're presented with silly jokes about morning sickness and mood swings in fun but unrealistic comedies like Father of the Bride II, Knocked Up, She's Having a Baby and Nine Months. Nicely lensed by Eternal Sunshine of the Spotless Mind and 25th Hour cinematographer Ellen Kuras whose creativity along with that of the inventive production designers helped transform their mostly Connecticut shoot into several distinct locations, Away We Go is further enhanced as a distinct "road trip" movie by Mendes' decision to utilize Alexi Murdoch as the sole singer/songwriter heard throughout. Murdoch's contribution in lieu of Mendes' favored score composer Thomas Newman worked as well as the unique standout mixed media poster of the film that looks as though it could've been the handmade cover for Murdoch's mix tape ambiance which at times subconsciously works like a musical version of the narration Mendes has utilized in his other films. 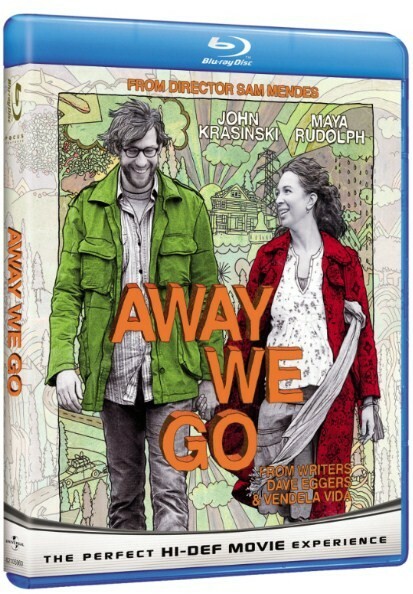 The first studio production to be 100% environmentally friendly in tandem with Earthmark/Green Media Solutions which helped the movie incorporate green filming to prevent excess waste and electricity, the disc boasts Blu-ray Live exclusives, feature commentary with Mendes and the writers, and two behind-the-scenes extras. Despite the fact that there's no changing the minds of those who have sadly misread the free-spirited near storybook for adults (without the preciousness of say, Wes Anderson's The Darjeeling Limited) as something far too literal and subconsciously snobbish, Away We Go definitely managed to win me over. 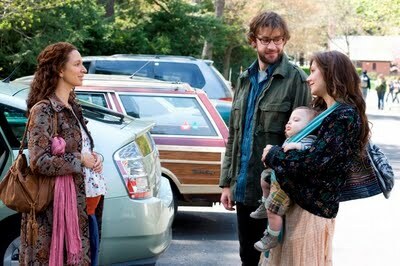 For, despite its tendency towards broad humor, some of the exchanges late in the film between Krasinski, Schneider, and Rudolph felt 100% honest and unlike anything I'd ever experienced as the type of internal fears we think but do not say aloud about bringing children into the world. Additionally, Mendes' meticulously rehearsed film succeeds via Kuras' and the actors' surprisingly loose, spontaneous style and rapid shooting schedule that remarkably enables Away We Go to feel devoid of an expiration or delivery date in a fresh, lifelike transfer to high definition.